Grandmom's Gravy - That's Life-The good, the bad and the ugly. When you love a brand, you want to share! That's Life-The good, the bad and the ugly. "Amazon Home Services offer customers over a thousand different services from quality, hand-picked professionals and is backed by the Amazon Happiness Guarantee." It has been about 10 years since the last remodel , paint and general facelift on the house. My husband says that even though things are still in good condition, that we have to keep the house updated because we aren't getting any younger, or richer so we need to do this. It will probably be the last time. Maybe we will move to a smaller place or if we stay, we will be too old to attempt to do this on our own. Usually we do one room here and there but this is the biggest reno that we are doing ourselves. I want to chronicle the events and share our experience with paint, flooring, etc. This isn't our first rodeo but we are still learning and finding new products on the market that can make life easier. Before painting, is the prepping. We had to clean and wash all the walls. This was a huge chore and after the walls were washed, they looked pretty decent but I had chosen a new richer deeper color. My husband purchased a Wagner automatic paint stick. He said it made the job so much easier than past painting. He did however have lots of issue with the ceiling which probably is due to the fact that we did not wash the ceiling and I imagine that there was a layer of cooking grease that may have deposited itself to the ceiling. The paint did not want to go on evenly. This really upset my husband, the perfectionist. I reminded him that we are not on a time table. After all, he is retired so what else does he have to do with his free time. My babies don't like all the noise and moving around of things during the renovation project. They find comfort in each other. I really love these two! Kitchen, hall Eand living room paint complete. Nest up is the counter tops. Have you ever noticed that when you start one of these projects and estimate cost, it just seems to grow and grow. What started out as a facelift for the kitchen is turning out to be a major renovation. Once you paint, everything starts to look shabby. My table an chairs looked old but in good condition so we did a refinish job on them before we did our floor. I am dreading doing the floor but I know it is one of the main things that need to go. We chose laminate wood and the more I read about it, the more I am having regrets. It is already bought and paid for so I hope for the best. At least we don't have toddlers anymore. I have used the phrase "crazy as a Banshee" many times as a figure of speech. I never really knew exactly what is a banshee. I was playing in the yard with my puppy, Markey-Mark and he was acting goofy and crazy and I thought, "What a banshee!" My quest led me to a scary website which actually explained that a banshee is a female spirit whose screams sound like a wild animal. I don't think I have been fair to my Markey. He doesn't scream like a wild animal, he just acts like a happy, happy puppy! So, going forward, I shall refer to my happy go lucky bouncing puppy as just that, a happy go lucky lovable but goofy puppy. 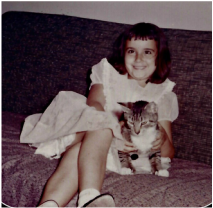 When I grew up, I was a cat person. 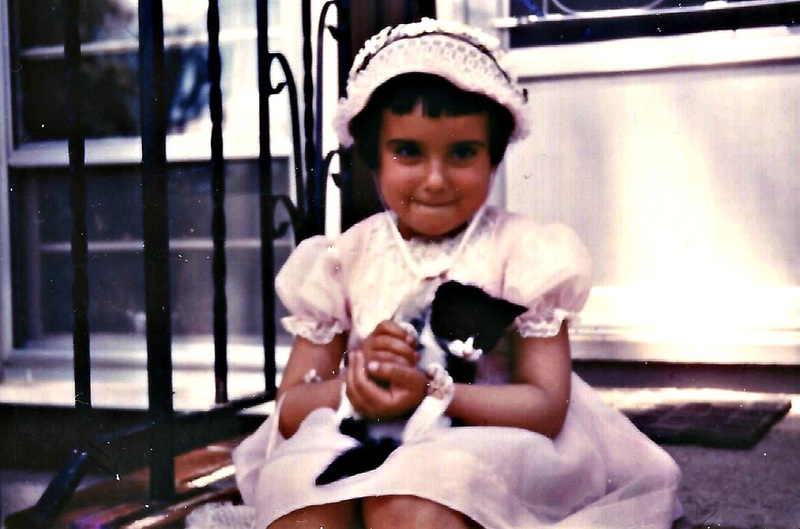 I always loved Dogs too but was only allowed to have a cat. My first cat was a black and white tuxedo cat. I loved that little cat, Whiskers was his name. When the family went on vacation, we had the neighbor look after him. When we returned we were told that he ran away and never came back. I was heartbroken. My parents got another cat that we named Twinkle Toes because she had those extra toes. My memories of Twinkle are quite clear and vivid. Twinkle-Toes, the cat with an extra toe on each foot. Twinkle was fierce. She was the epitome of an independent female, and I learned a lot from her. She stood her ground and even went nose to nose with a German Shepherd dog, backing him down. In those days, neutering a cat was a rare occurrence so needless to say, Twinkle had several litters of kittens. We always found homes for them but ended up keeping one special one. Frisky. We had Frisky for about 5 years and he passed away from distemper. Twinkle outlived him but ultimately passed at 13 from cancer. And so began my prequel to being the retired old cat lady. Don't misunderstand me, I am definitely not there yet but have several friends who are including my daughters! i remember each and every one of my kitties. After Twinkle came Charlie named after Charlie Chan. He was my first Siamese cat and certainly not my last. When I got married, I thought it best to leave Charlie with my parents since he had stolen their heart and I did not want to take him away from them. My husband knew how much I loved cats and surprised me one day with a cute little tabby kitten who he had named Ding-Dong because she would run around in circles after her tail. My heart grew with each cat that I adopted. There was Fluffy, Neffie and Ramsey . Toby, Tyler and now Leo. Each one was special and loved and stories of their loyalty and devotion will follow in a later post. The last three were tuxedo cats and I have to say that Black and white cats are very special. Leo thinks he is a dog. He was very young when we got him and he immediately thought that my chocolate Lab was his mom. She did not appreciate his breast feeding attempts but that did not stop him from snuggling up to her. They eventually formed a strong bond. Leo is very tolerant of other dogs as well. When we adopted our new puppy I was concerned that he may not take to him but he did so admirably. He took the playful puppy under his wing and showed him the ropes. There is a common bond between cat people. We know, we just do. We get it. We purr and meow when we see a cat as if to say hi and introduce ourselves to it. I don't bark when I see other dogs but I do meow when I see cats. Why??? I haven't figured that one out yet but I think it may be one of the wonders of the universe. By the way, you don't have to have 100 cats to be a crazy Cat Lady. You just have to love cats, have at least one cat that you speak to regularly in their language, of course. ​So, there you have it. 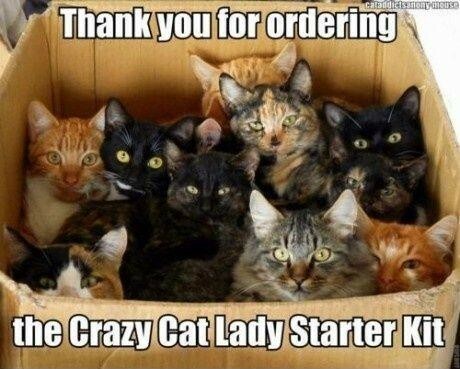 This is how crazy cat ladies are made. One endearing feline after another until they completely turn you into a meowing, purring human. I forgot how much fun having a new puppy could be. With each new encounter comes a reaction. Sometime unexpected and downright funny. Like a child discovering the world so is the puppy learning about his surroundings. This video is Marco, my Shepherd / Lab Mix 8 month old puppy the first time he encountered the lawn sprinkler. Well, I am not sure where the expression "The Dog Days of Summer" originated but I do know what it means. It gets so hot that you just want to find a shady spot and sleep, just like a dog! It hasn't reached that point yet in NJ but when you have a young active puppy you need to find ways to keep them entertained so that they will stay out of mischief. I made this short video of Marco. It is his first time, actually second time in a pool. We had to coax him the first time and unfortunately I wasn't video ready but now that he knows just how much fun it can be, he appears to be entertaining himself. 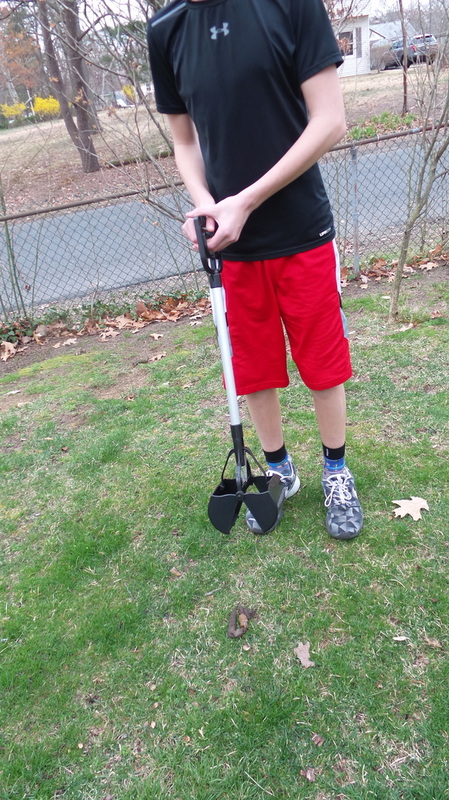 I have owned dogs since the 1970's but never before now have I owned a Pooper Scooper. My husband generally took care of the yard. He claimed that when he mows, it picks up the poop, which it did. My past dogs also had manners. They would never poop on my lush green lawn, they always went in an obscure corner along the edge of the fence so that if something was missed, then it would be out of the way. As the owner of a new puppy who has absolutely no concept of what is politically correct, he poops wherever he wants. I suddenly had the need for poop bags and Pooper scoopers. There is a jungle of different types in all price ranges. I looked at the ones at our local PetSmart which were metal and pretty heavy. I eventually did get one from Amazon which is lightweight and can withstand being left out in the rain and weather. It is plastic and can be operated with one hand. It is spring loaded and grabs the poop and holds it until you release the trigger. 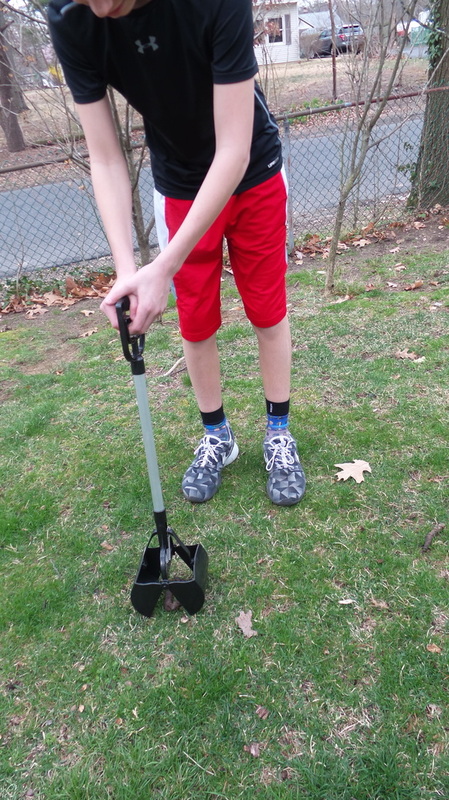 It is simple and convenient and even the kids want to help seek, grab and destroy! 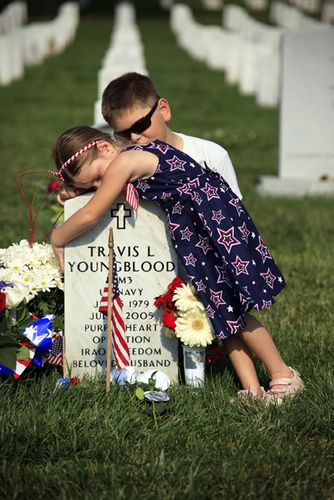 ​As the Memorial day weekend approaches, it is time to reflect on those who have died for their country. To pay tribute to the brave men and women who gave their lives for freedom. While you have your beer and barbecues or visit the shore, remember the brave and selfless. "Memorial Day" by CW Johnson: We walked among the crosses Where our fallen soldiers lay. And listened to the bugle As TAPS began to play. The Chaplin led a prayer We stood with heads bowed low. And I thought of fallen comrades I had known so long ago. They came from every city Across this fertile land. That we might live in freedom. They lie here 'neath the sand. I felt a little guilty My sacrifice was small. I only lost a little time But these men lost their all. Now the services are over For this Memorial Day. To the names upon these crosses I just want to say, Thanks for what you've given No one could ask for more. May you rest with God in heaven From now through evermore. Having to go to the dentist always brings on waves of anxiety so as long as I go for my checkups, I tend to ignore strange things that happen in my mouth in between visits. A filling falls out and I think ...."as long as it doesn't hurt, it will be ok." I know this is not true but I rationalize anyway. So here is what happened......I was supposed to get a tooth filled in January but I cancelled the appointment. The office has been calling relentlessly trying to reschedule but I casually ignored the calls. Finally when I realized that I couldn't put it off forever, I agreed to come in. Somehow I got my wires crossed and thought I had a 9:20am but when I arrived, I was told that the appointment was 10:20. I was madder than mad. I blurted out, without thinking, that I would not be waiting an hour. They will have to reschedule! After all, I am a very busy woman. So, I left with some absurd date in the distant future to have the tooth filled. Then, wouldn't you know but Murphy's Law kicked in and I lost another filling, this time in the front and that back tooth started to catch everything and anything that went into my mouth! It became a virtual Venus Fly Trap. I had to eat crow and call the dentist to beg for an appointment, anything. I will even take off from work if it means getting this fixed. And so I took today off to resolve these issues. I was squeezed in so he only had time for one tooth. He took one look at that back decaying wisdom tooth and proclaimed that he will need to remove it. He fixed the front tooth that shows but I will have to return for the extraction. More time to contemplate and imagine the unimaginable. But hey, I get another day off from work! Now here I sit writing this blog. My mouth still numb but the novacane is wearing off. I glance at the clock and it is "tooth-hurty" Yup, 2:30. I forgot what it was like to have a high energy puppy in the house! Marco is now 7 months old. We are still not sure what mixture our Mutt has. We know that his mother was part shepherd and we can see some Lab in him, however I can also see a bit of doberman, ridge-back and hound. We have no idea how big this guy is going to be. What were we thinking? I guess we have always been drawn to large breed dogs. Our first was a Shepherd-Austrian Cattle dog, then we had a male yellow Lab who was 125lbs in his prime and then a Chocolate Lab Girl who reached an overweight weight of 80 in her prime. Now we adopted this Mutt. A rescue dog. His story was very sad. His pregnant mom was picked up and she gave birth to a litter. In her desperation to protect them, she killed and ate them. Our Marco was the sole survivor of this carnage. He is very lovable and affectionate despite witnessing this helter skelter. We give him three one mile walks per day and we all play ball with him in the yard. The neighborhood kids come over and love playing with him too. Here is a video of me playing with Markey-Mark. If you want to make a great gravy, white, red or brown, consult My King Cook for tips on making the best gravy ever.